Do you have questions about our Crown batteries, or questions about solar in general? Give us a call at 1-800-472-1142. Crown Battery specializes in deep cycle flooded batteries and their CRP Power Module Series is the culmination of years of experience and investment in advanced battery manufacturing processes. Crown CRP Power Modules are high capacity 2-volt cells encased in individual steel trays. CRP Power Modules are built at Crown’s highly automated manufacturing facility and feature heavy-duty cast-on strap and terminal post structures, thick lead plate with properietary plate design, and Crown’s own active material manfactured on-site at Crown’s manufacturing facility. The Crown CRP Power Module series of 2 volt high capacity batteries offers an impressive combination of features. CRP Power Modules utilize some of the industry’s heaviest lead plates and are designed for superior cycling performance and longevity in deep cycle applications. We recommend the CRP Power Modules for large off-grid home battery banks, commercial off-grid systems and larger battery backup applications. 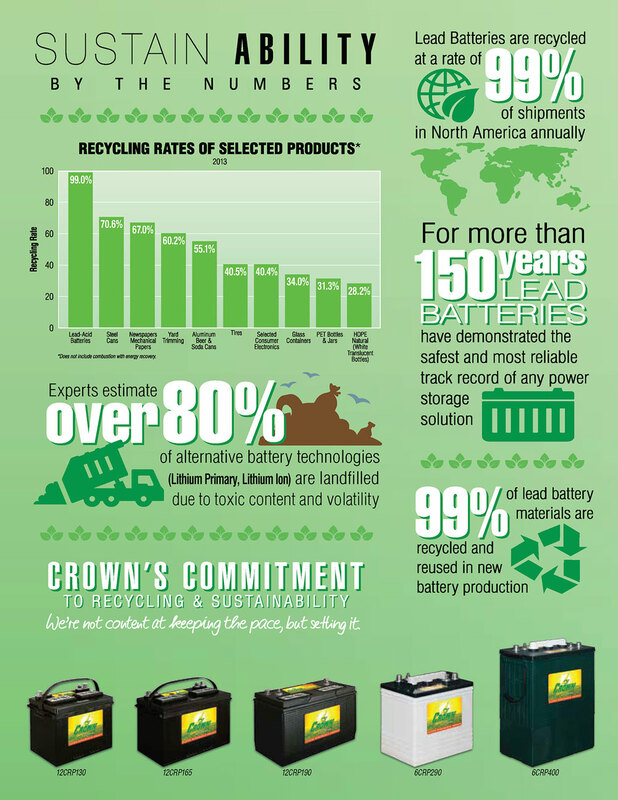 Established in 1926, Crown has grown to an international leader in battery supply. You can find Crown Batteries in heavy-duty equipment on- and off-highways all over the world. Throughout the railroad industry, moving freight efficiently to global markets. Our batteries are powering underground mining equipment in the Americas, Africa and Asia. They can be found in steel mills. In renewable energy installations around the world. In the recreational marine and automotive industries. And we’re reaching new heights in the aerial access equipment industry. Whether it’s floor care equipment at work in New York City or Tokyo…or an electric truck lift operating in Flint, Michigan…Crown Batteries can be found getting the work done. On time. In all critical applications.